Now we're working with the fourth period/row in the table of elements. You may have an easy way to know the number of electrons in a neutral atom, but the placement of those electrons gets a little more complex. Let's take a look at the arrangements of electrons in the basic elements (left and right sides of the table) of period four and the more complex arrangements of the transition elements (in the middle of the row). If you think this is a little over your head, go back and look at the elements 1-18 that have organizations that are a little more simple. Take a look at the picture below. Each of those colored balls is an electron. In an atom, the electrons spin around the center, also called the nucleus. The electrons like to be in separate shells/orbitals. 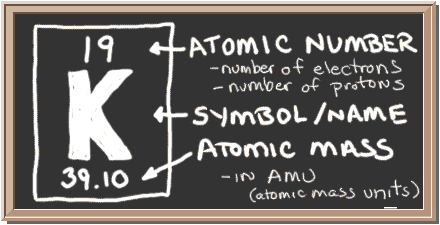 As you learn more about atomic structure, you will learn that the electrons don't stay in defined areas around the nucleus. They are found in clouds that can have different shapes that include spheres and dumbbell-like shapes. So remember when you look at our breakdown that the electrons aren't always in a nice neat order as shown here. You already know about the the first row. Like other elements in the first row, potassium is a member of the alkali group with sodium and cesium. All of the members of the alkali group have an outer shell with only one electron in orbit. Because there is only one electron, the element is very reactive and searches out other elements to make new compounds. You will learn about many salts where alkali metals bond with halogens that are looking for an extra electron. Potassium is so reactive that it can burn when introduced to water. ► More about the history and places to find potassium.